Recently, one of our followers reached out asking for some assistance for an important cause. She is a mental health advocate and public speaker. She asked me for help to make small crocheted turtles. MHATs or Mental Health Awareness Turtles, will be distributed to patients who are dealing with traumatic experiences that led to their ongoing struggles with mental health. This individual is working to help others who, like herself, have endured horrific experiences and SURVIVED. In the aftermath, they are now left with lifelong battles. We can HELP! These little turtles have provided big benefits to patients dealing with these traumas. The goal of the MHATs is to provide comfort and start conversations. A reminder for people to come out of their “shells” and discuss mental health openly without fear of stigma. Patients who are living with ACE or Adverse Childhood Experiences, Agoraphobia, cPTSD or complex Post Traumatic Stress Disorder, Severe Dissociative Disorders and many others both inpatient and out-patient will benefit from this project. She needs to meet her goal of 100 turtles by October 1st,2018. All the turtles we make and send to her will be 100% donated to this cause and help patients. If anyone would like to help, please read and follow the pattern below. THIS IS NOT MY PATTERN AND THERE IS NO VIDEO TUTORIAL. I have provided photos of my own turtle which I made using this pattern to show you the end result. You can find the address to ship your turtles to at the bottom of this page. I have made it big and bold so you cannot miss it! DON’T forget the deadline is OCTOBER 1st, 2018. She will be speaking at an event on OCTOBER 11th, 2018 and will need to have the turtles well in advance. MHATs Pattern is property of Erika Reva Memering. Body and Head: You can use any colors you want. Scraps of yarn even work, since this doesn’t take too much yarn to make this project. Shell: You can use any color you want. Scraps of yarn even work, since this doesn’t take too much yarn to make this project. Using Your Main Color, work in BLO and in continuous rounds. Put Stitch Marker at the beginning of each round to mark your rounds if needed. Stuff head a little more if needed. Sew to body between 2 legs. Using Your Accent Color, work in BLO and in continuous rounds. Be sure to have the Right Side facing out and sew shell to the body. Once you have it 3/4 of the way sewn closed, be sure to stuff the shell, but do not stuff too firmly. Rnd 6: SC in next, [Sk 1 st, 6 DC in next st, Sk 1 st, SC in next st] 7 times, SC in last sts, Sl st in next st.
For first one, fasten off with long tail for sewing. For second one, fasten off with short tail. Sew head to one side of body, embroider eyes and nose with black yarn, Sew ears to head/body. Sew body front and back together, stuff the piece before closing it completely. Use the video tutorial to learn how to attach all the pieces. I often receive requests to do specific tutorials. My to-do list is always growing. Once in a while I get a suggestion that makes me stop everything and move that special request to the very top of my list. I was asked a short time ago to design and film a dinosaur for a little boy battling cancer. Since my videos have easy to follow instructions, a YARNutopia follower wanted to make one of their own to gift it to this special young man. Spike the T-Rex Dinosaur is my latest amigurumi design that I hope is just the right creation to bring a smile to a sweet boy’s face and know that he has this fierce cuddly buddy to help him through a very tough time! Sending lots of love and good vibes out into the universe to all! Rnd 23-24: SC in each st around. Stuff the head one last time. SC 1st and 4th St together to close hole. Fasten off, weave in end. Rnd 3: 2SC in 1st st, SC in the rest of the sts around. Stuff tail and sew it to body. Sew spikes to top head. Sew black pupil to white of eye, sew to dinosaur head. Sew eyelids right above eyes. Arms: Make 2 with Pool, working in BLO and in continuous rounds. Lightly Stuff Legs and sew to body, using photos as a visual guide. 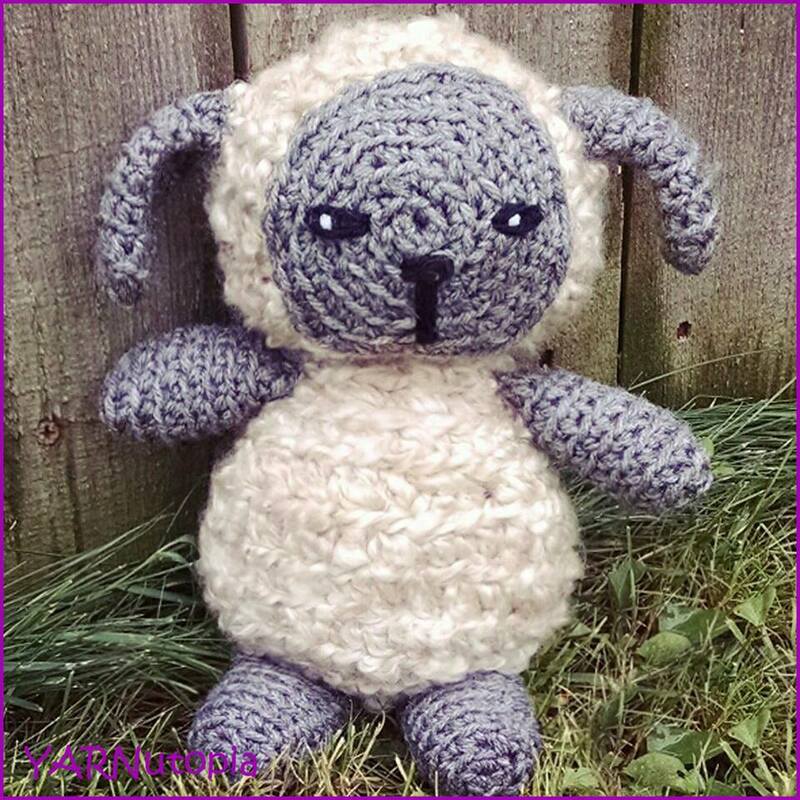 Liked this amigurumi? Try making the Hippo Pillow here! !